Following the success of the ERF “Roadshow” series in Vietnam and Indonesia in 2018, IERA in conjunction with the U.S. 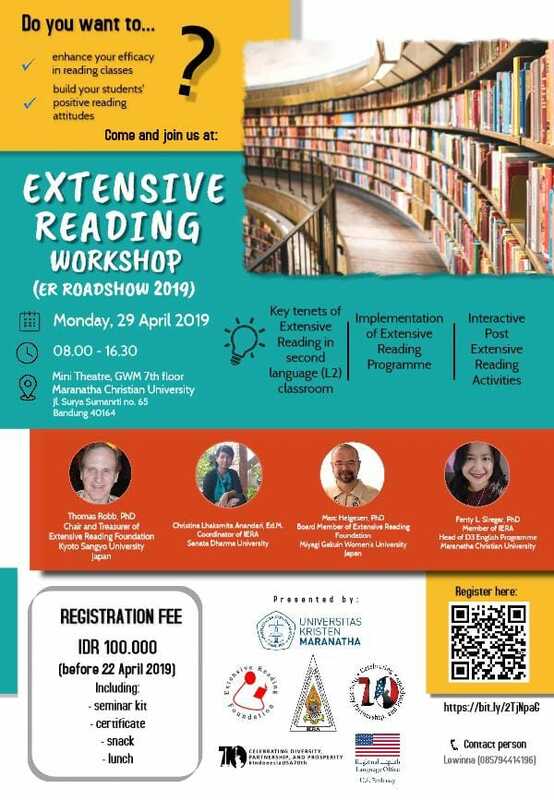 Regional English Language Office in Jakarta, will conduct a 10-day workshop in 5 cities in Indonesia from 24 April through 6 May. 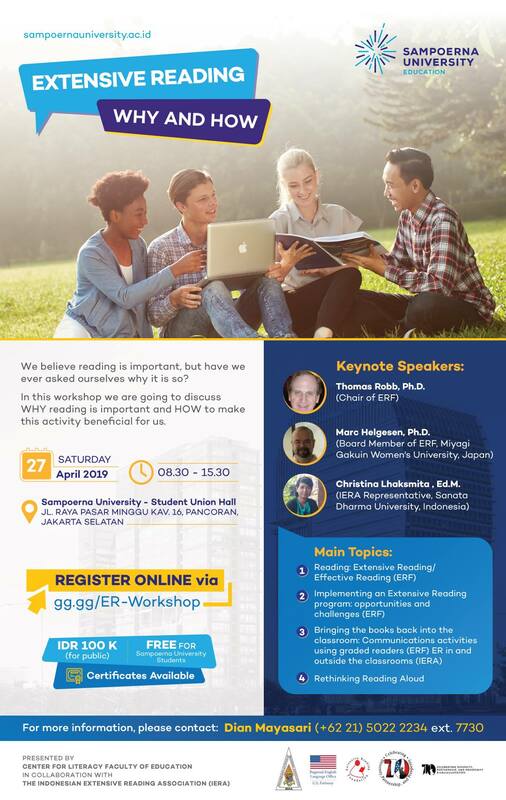 Marc Helgesen, Tom Robb and Lhaksmita Anandari will be joined by other IERA core members (Yuseva, Anita, Lanoke, Fenty, Ariana, and Ivonne) for a compelling set of “Why” and “How to” sessions on Extensive Reading. The audience will consist of university and secondary teachers, librarians as well as local American Peace Corps volunteers. See the two posters below for further details. Click on a poster to see a larger version! Between Marc Helgesen’s visits in May-June, Rob Waring’s team including Paul Goldberg (Xreading.com) and Todd Beuckens (Elllo.com) — 30 Aug. to 13th Sept., and Tom Robb’s tour of seven cities (5-16 September), teachers and students at over 20 universities in Vietnam learned about the need for Extensive Reading in their programs. Marc Helgesen and Tom Robb were sponsored by the Regional English Language Office of the U.S. Embassy in Hanoi, while Rob & company’s travel was self-supporting. Rob’s and Tom’s full schedule is listed here. One feature of the lecture/workshop series was the “Book Lottery” which resulted in $5000 in books being donated to eight lucky schools in the country. See the link above for further details.